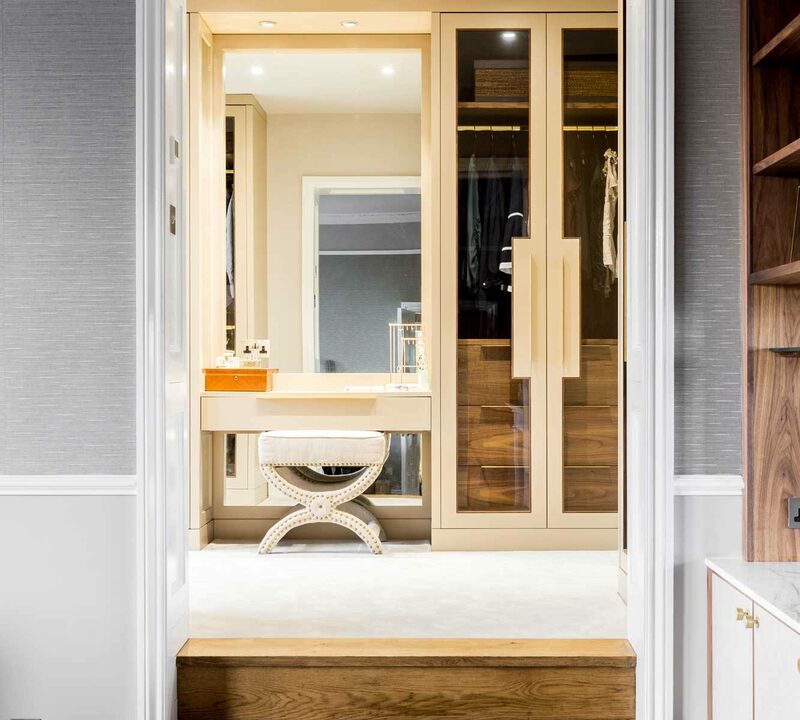 Our client approached us in the summer of 2017 with some bespoke furniture requirements for her large residence in Bath. 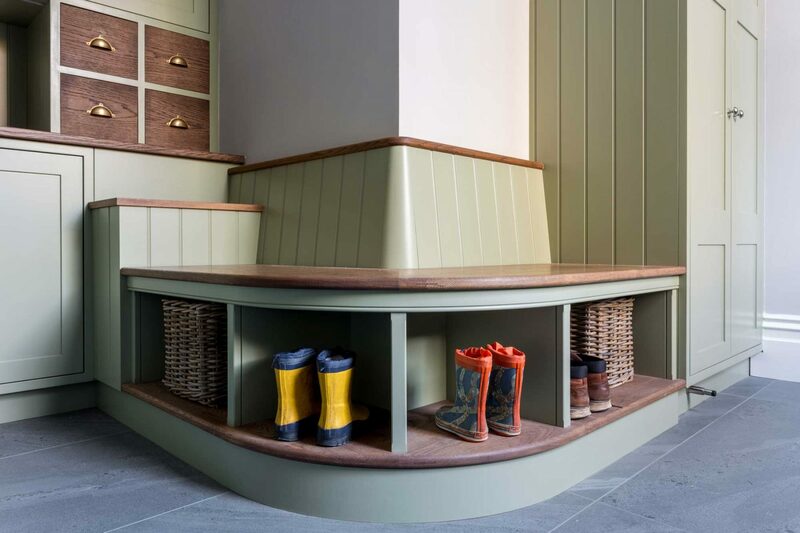 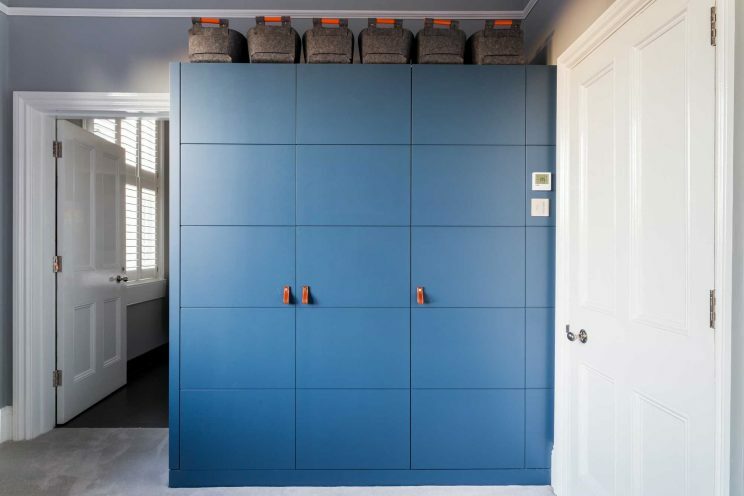 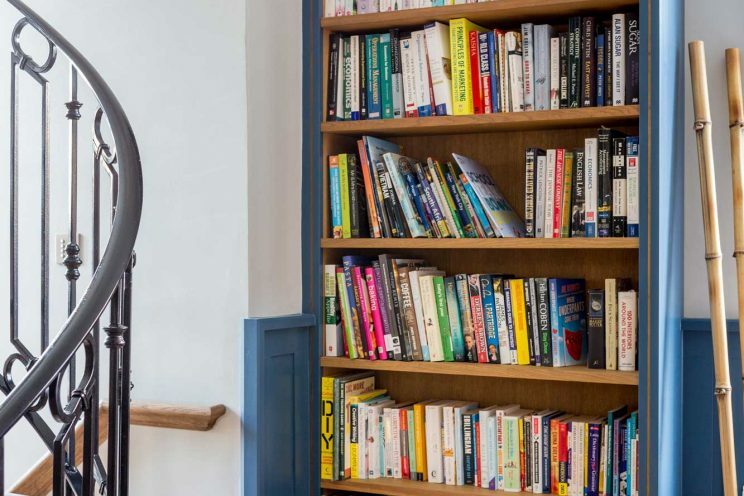 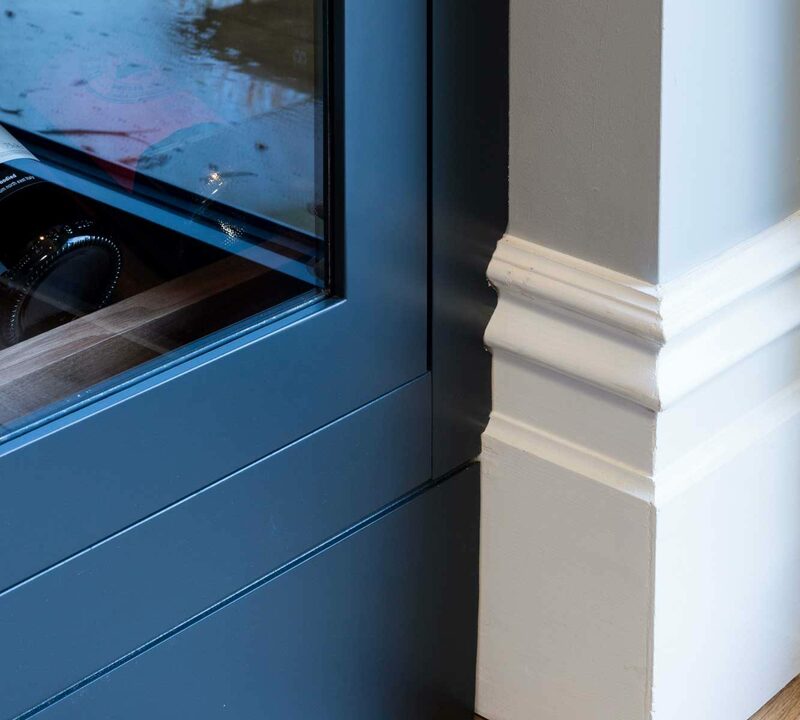 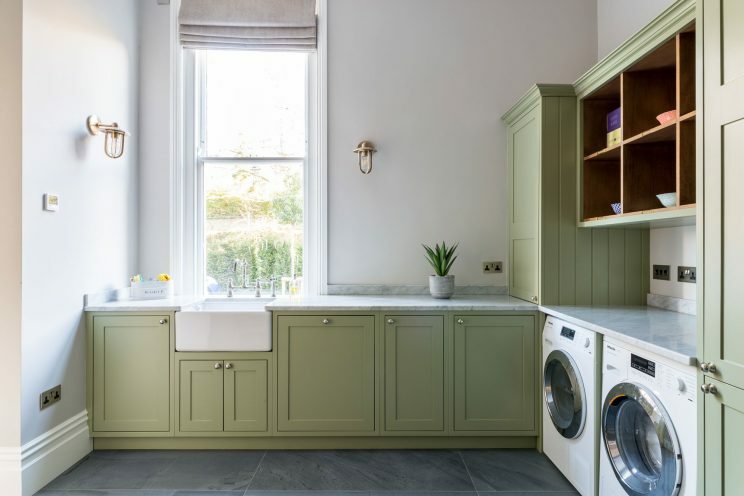 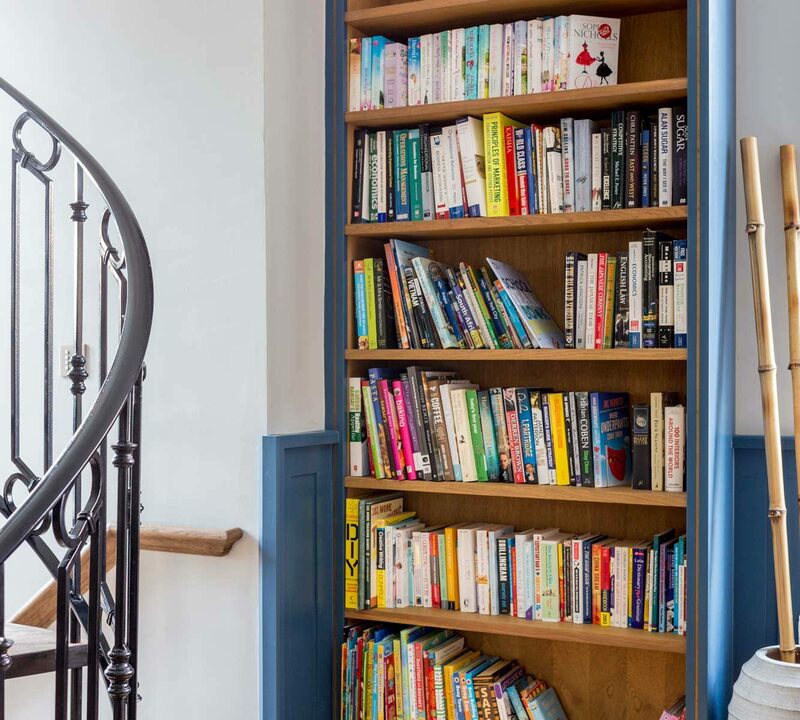 The initial brief was for a utility room, a library and bespoke wine storage, but the project developed with an additional walk in dressing room and wardrobes for her children’s rooms. 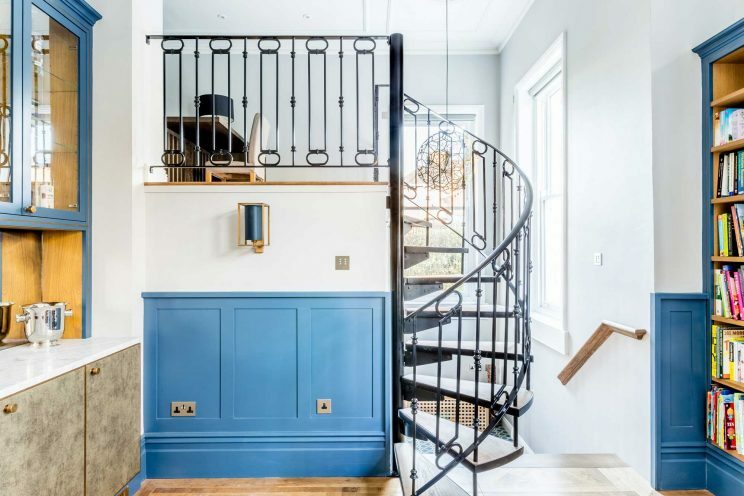 Our client had a very keen interest in interiors, particularly hotel interiors, and we worked closely with her on the designs—shaping them into beautiful yet functional domestic designs.We kept to fairly classic shapes and proportions in order to complement the period architecture of her home, but introduced lots of interesting materials and textures. These included unpolished solid brass, Elitis wallpapers, antique mirror glass, several different marbles, walnut, oak, Turnstyle and Armac Martin ironmongery. 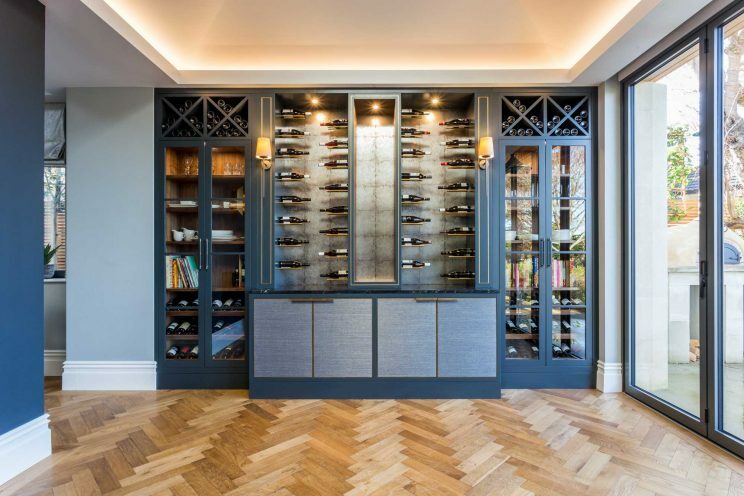 The project took several months of design, manufacture and installation and we took great pleasure in building beautiful furniture designed to do justice to the wonderful property. It was a really exciting collaboration and we enjoyed working closely with the client. 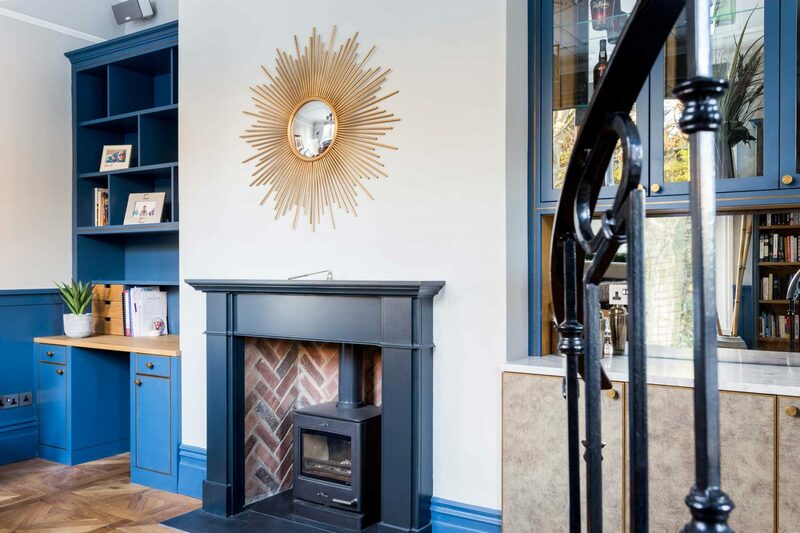 The results were impressive and involved a huge team effort—from Alex in the design department, Natalie in operations, Tom S, Ben, Neil, Andy, Richie and Will the cabinetmakers, Brett and his painting team and all of the site team. The wine wall was designed in collaboration with Mia Marquez and crafted for the far wall in the open plan kitchen. 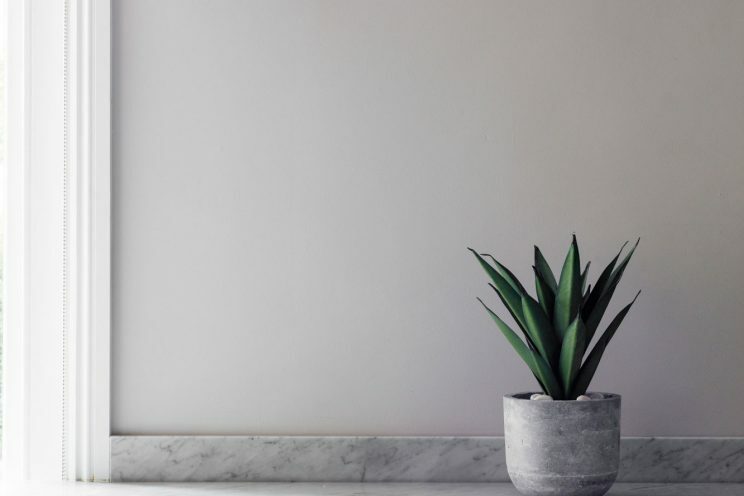 It created a beautiful yet functional feature wall, which complimented the rest of the space. 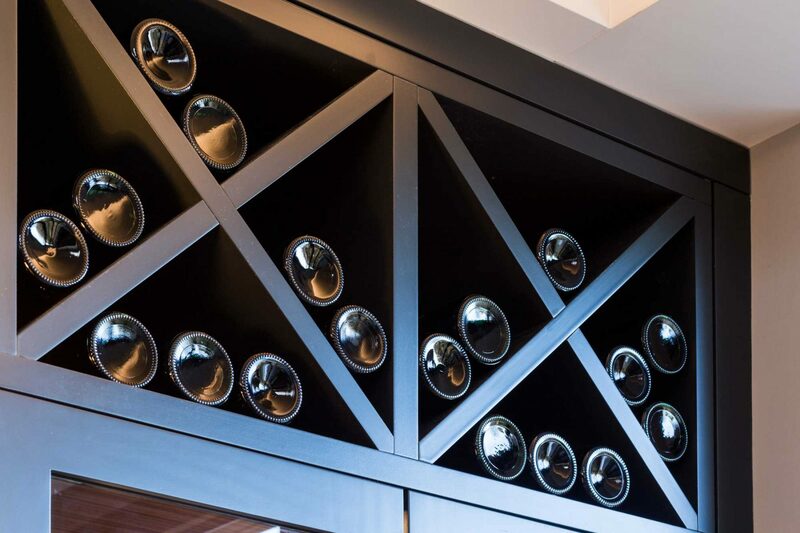 Every inch of this design was well thought out in principle and practice, and was designed to hold and display 128 bottles of wine! 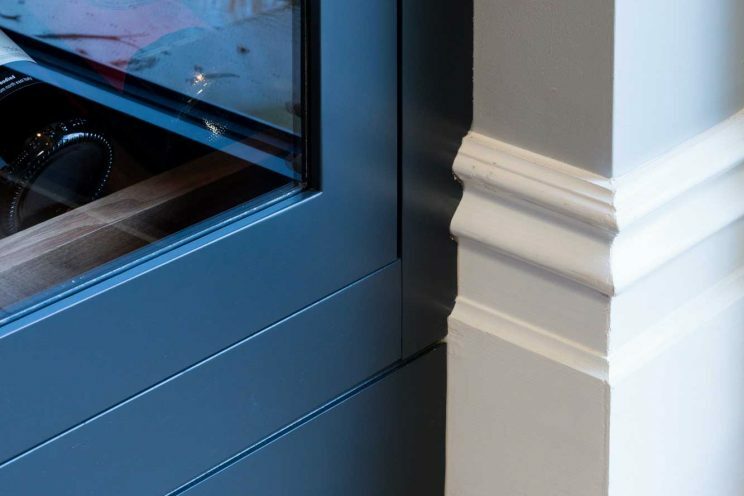 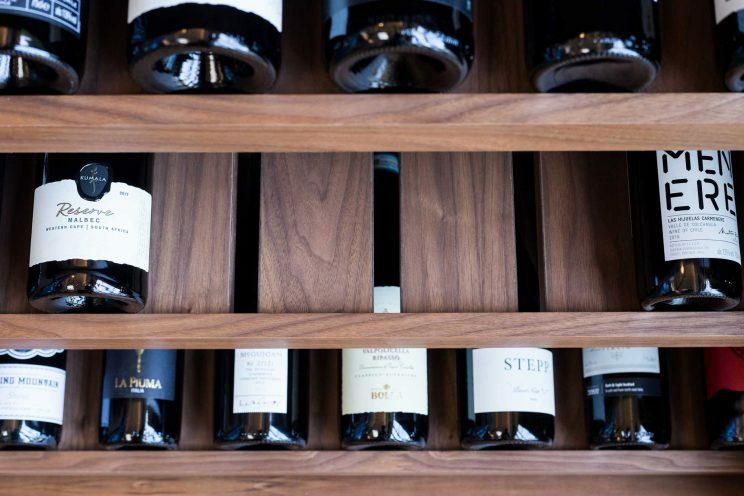 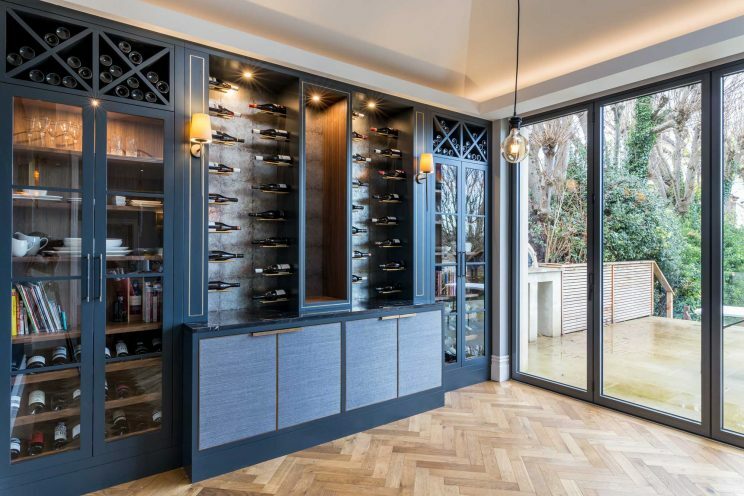 The glazed doors on either side of the wine wall were crafted from Accoya wood and finished in house with Farrow & Ball Railings, while the cabinets were made from walnut. 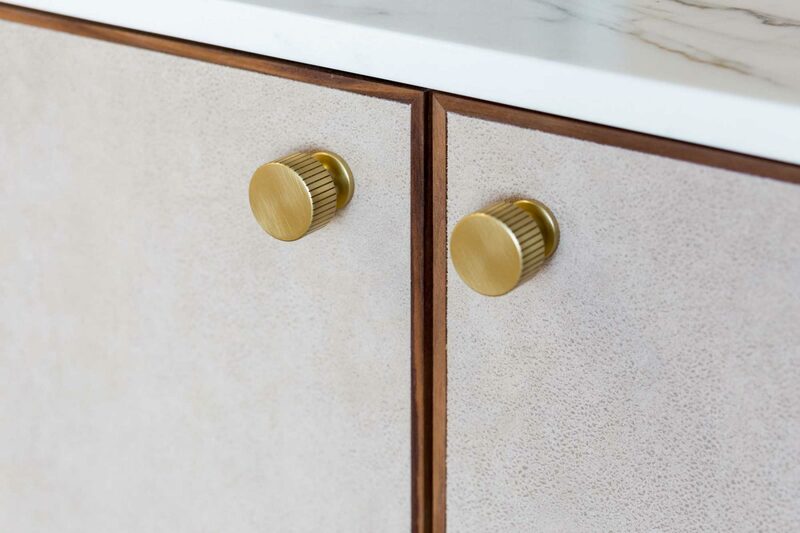 Once crafted, the central carcasses were fitted with a series of solid brass bars—slotted in by hand. 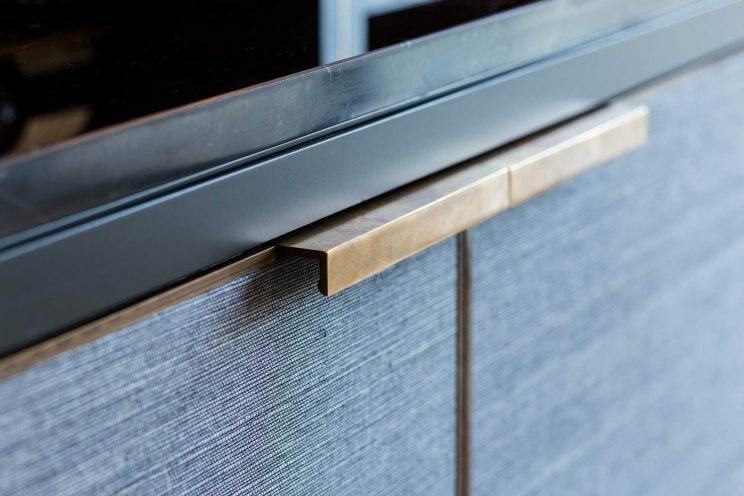 This complemented the brass inlay which was inserted throughout the panels. 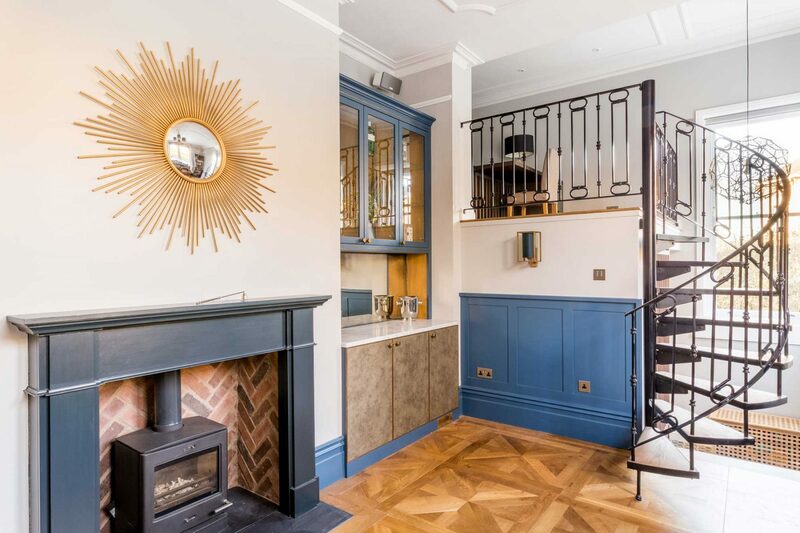 To finish off this centrepiece, an antique mirror effect wallpaper was fitted on the back wall to create a sense of opulence and to reflect light around the room. 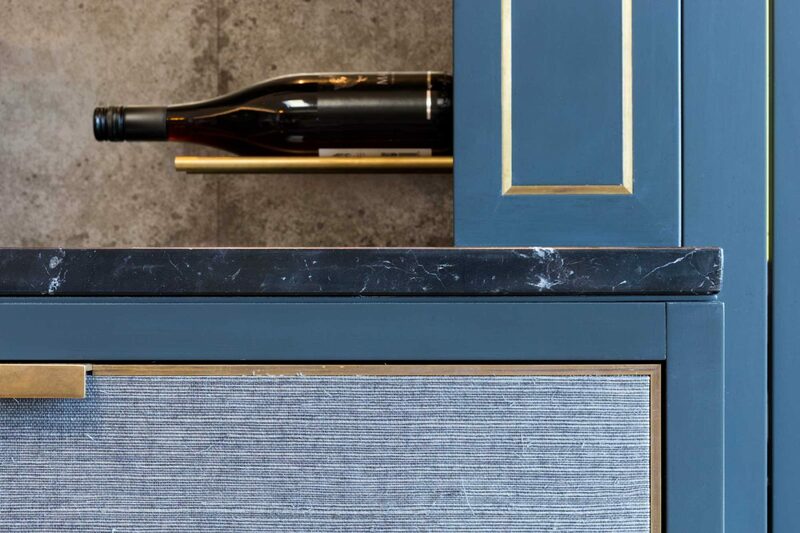 This beautifully complimented the stunning Nero Marquina stone worktop and the Armac Martin solid brass handles on the doors. 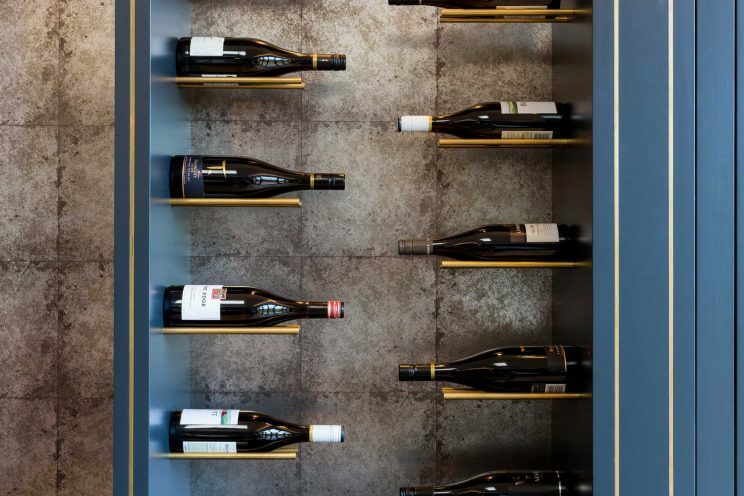 Find out more about how the wine wall was made here. 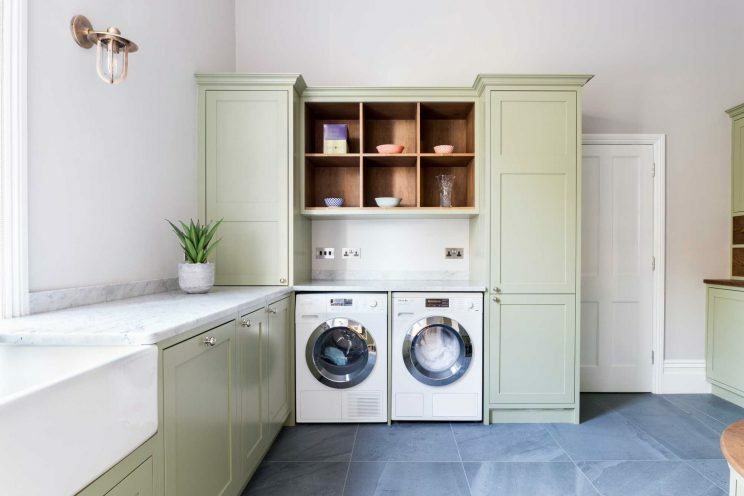 The utility room was designed to work as a laundry area and boot room. We crafted custom made cupboards and cabinets from oak with several unique storage solutions within. 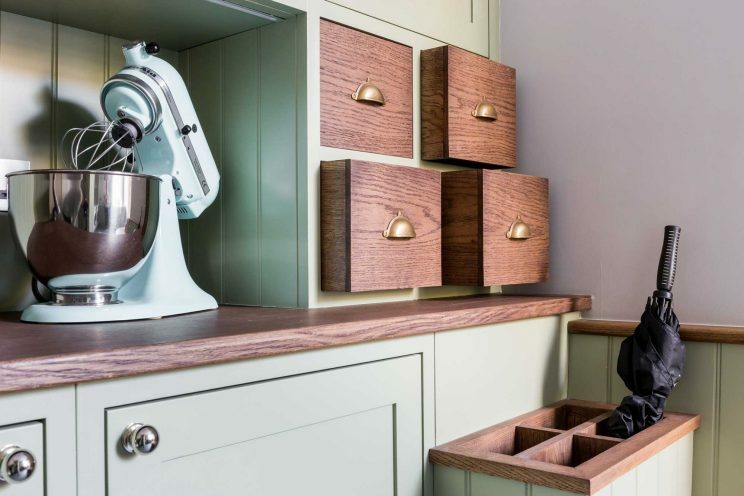 The solid oak curved seating area was designed with space for shoes underneath and a designated umbrella stand, while the large cabinet featured eight solid oak pull out drawers with brass cup handles and glazed display cabinets. 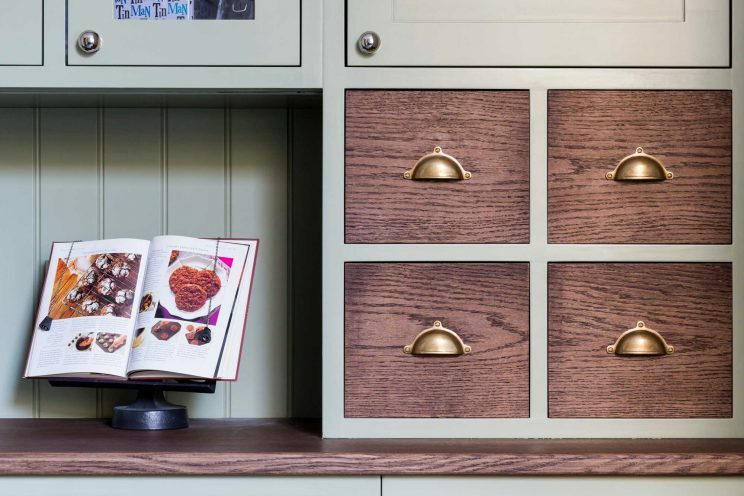 We finished the cabinets with Armac Martin handles. The top of the cabinets featured bespoke mouldings to match the period characteristics of the house, and were finished and painted in house in F&B Lichen. 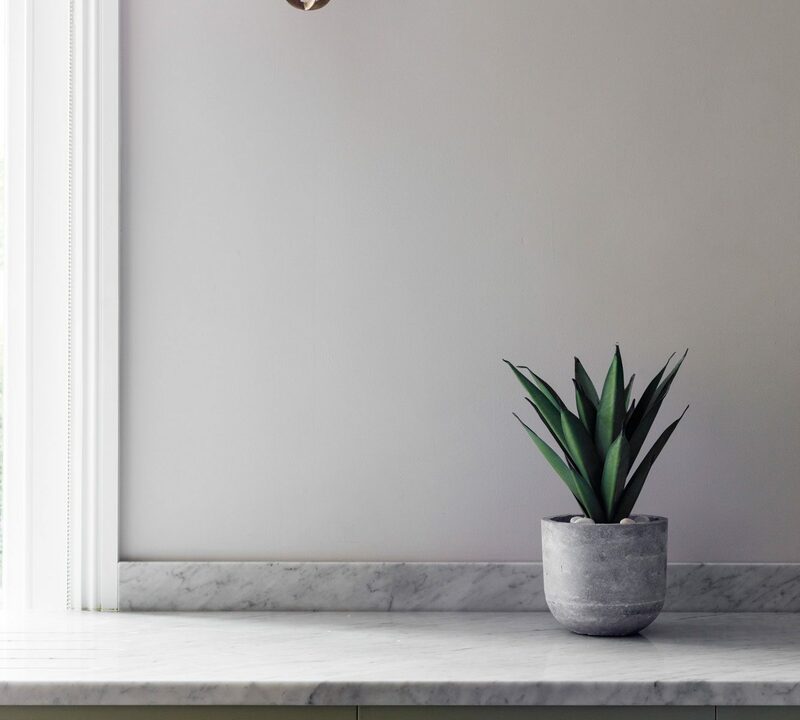 We also handcrafted vertical panelling to add a little detail into the room and finished the counter top with a polished Carrara stone. 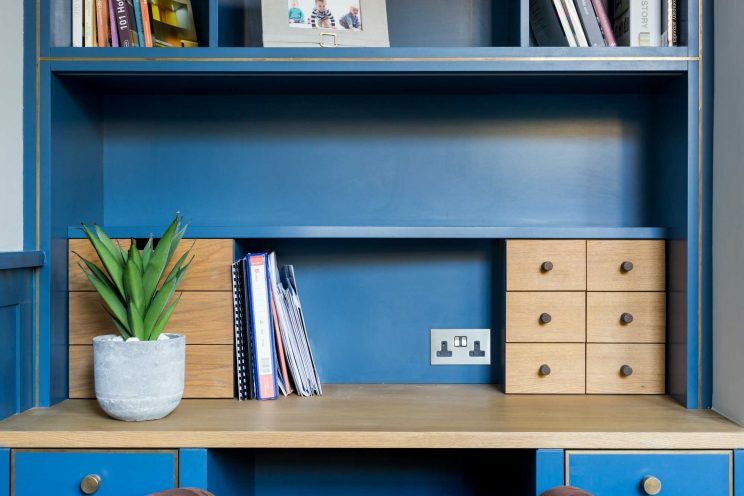 The library featured a beautiful study desk, bookshelf and oak work desk. 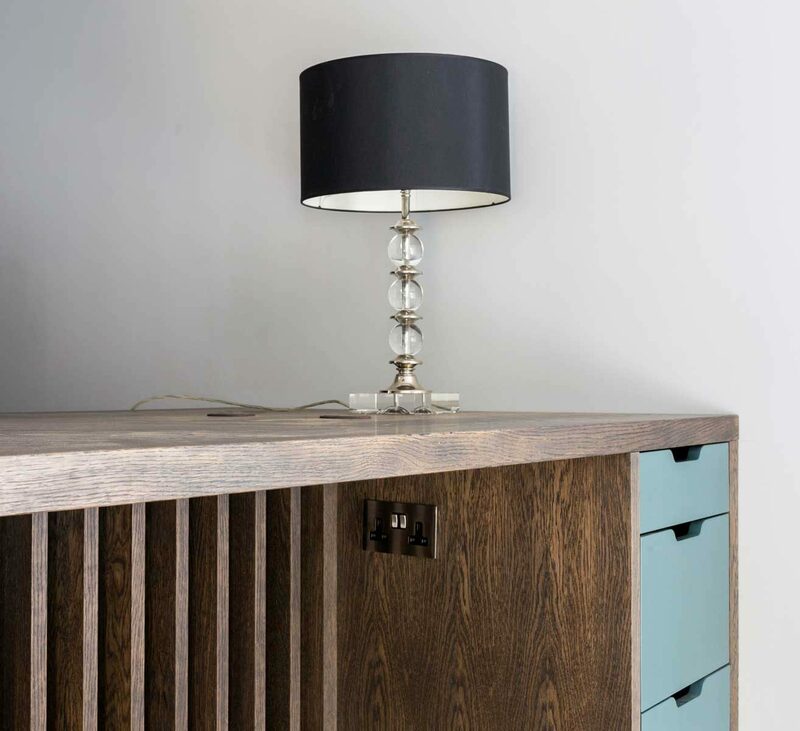 Crafted from oak and finished in a rich Stiffkey Blue, the study desk featured solid oak drawers and work top and also custom designed tier shelving. 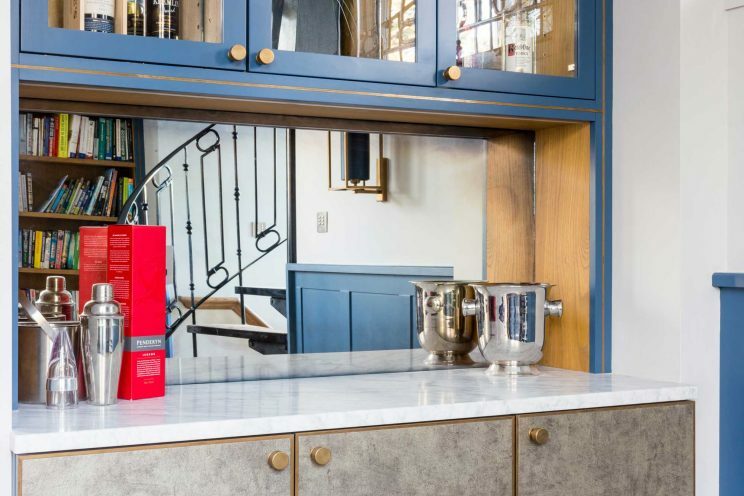 Alongside this, we also designed and crafted a beautiful drinks cabinet with an antique mirror back and a polished Carrara stone top. The lower cabinets were covered with a leather like material, which beautifully complemented the rest of the design and added extra depth and texture. We finished the cabinets with round brass handles from Armac Martin and also inserted brass inlay into the cabinetry, which continued the theme from the wine wall in the kitchen. 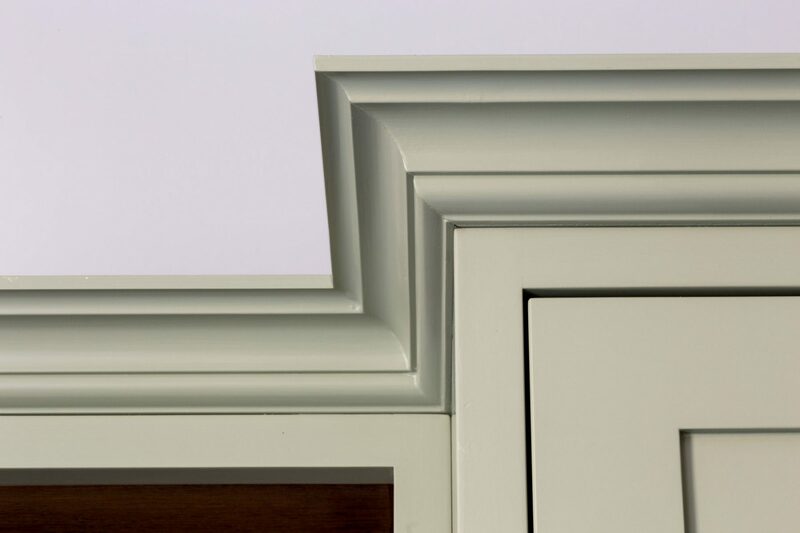 We also added custom mouldings on top of the cabinets to match the heritage characteristics of the home, as well as the wall panelling with integrated socket holes. 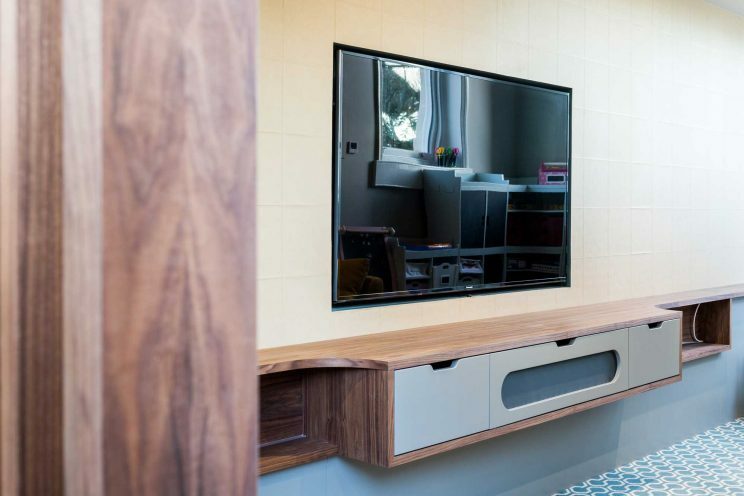 The stairs led down to an enclosed TV area where we crafted a custom TV unit and slated dividing screen using walnut. 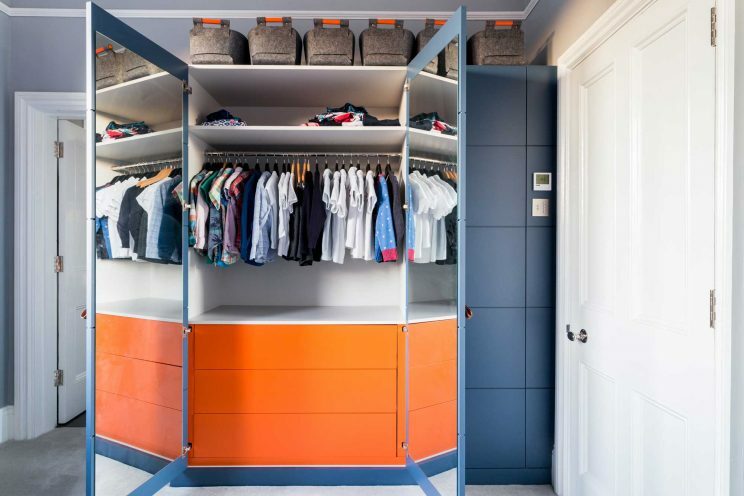 The unit featured a modern, sleek design with painted drawers and a flap down door complete with inlay speaker fabric. 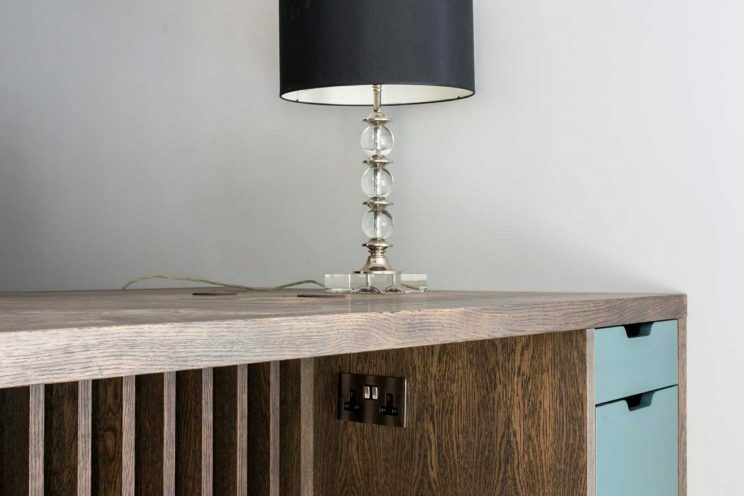 This allowed the TV remote to be used without having to disrupt the door. 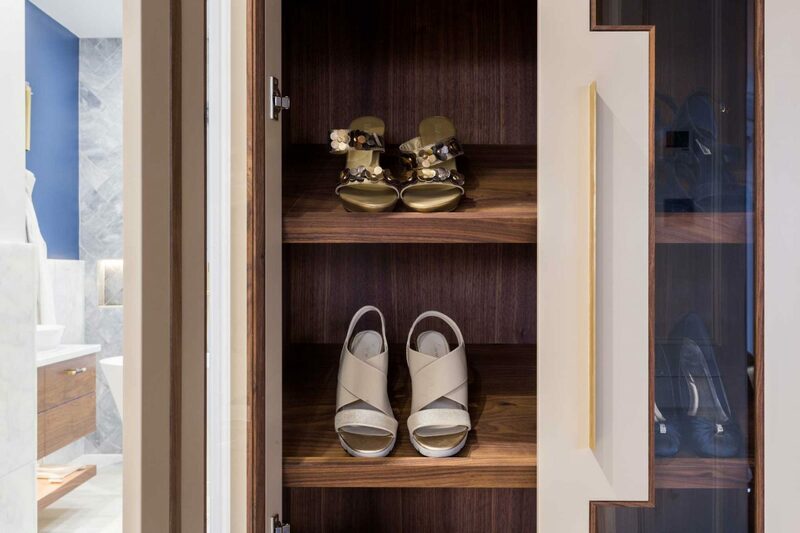 We worked closely with designer Mia Marquez and our client on the creation of this walk-in dressing room. 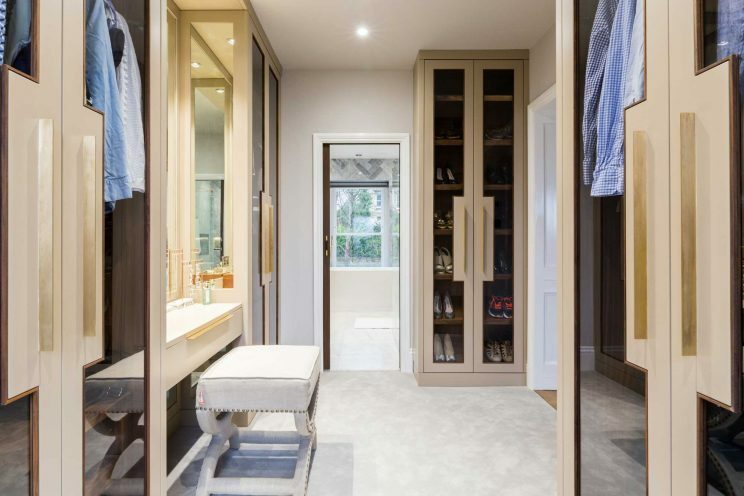 Each wardrobe featured bespoke storage solutions to suit her exact needs, which included pull out shoe racks, a slated shoe cabinet, internal deep drawers and hanging solutions for different garments. 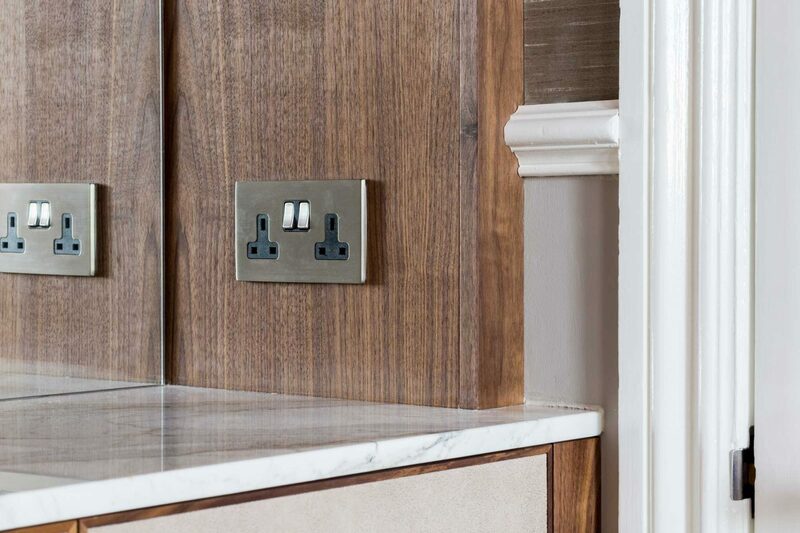 We crafted the cabinet interiors from walnut and contrasting this with Accoya doors, with a walnut trim, which we paint in a classic London Stone. We handmade the solid brass handles for the doors and drawers and also included an elegant enclosed dressing table with surround mirror panels. 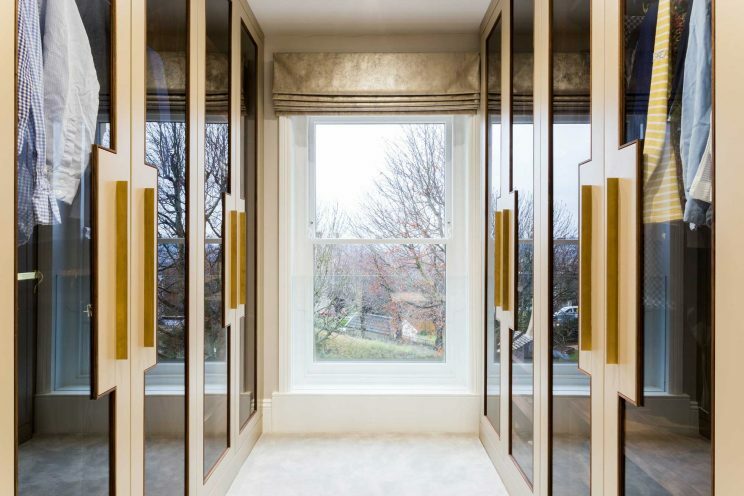 We crafted these symmetrical alcove cabinets for the master bedroom which led on to the walk in dressing room. Made from walnut, the cabinets featured mirror backs with vintage leather vinyl on the fronts of the lower door cabinets. 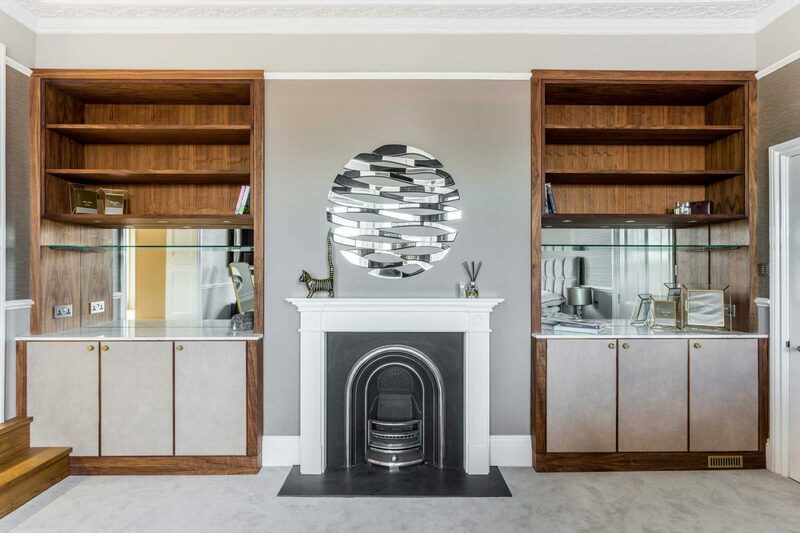 We inserted a glass shelf below the walnut shelving, which featured underneath spotlights, to compliment the mirror backing and also added a luxurious marble stone top. 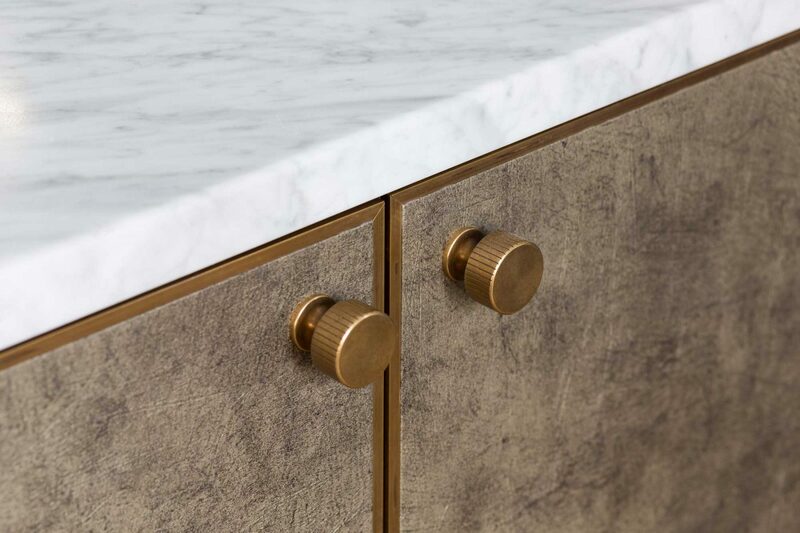 Armac Martin brass round handles were added to the doors to compliment the rich tones of the wood. This wardrobe was designed by our team and the client for her boy’s room. 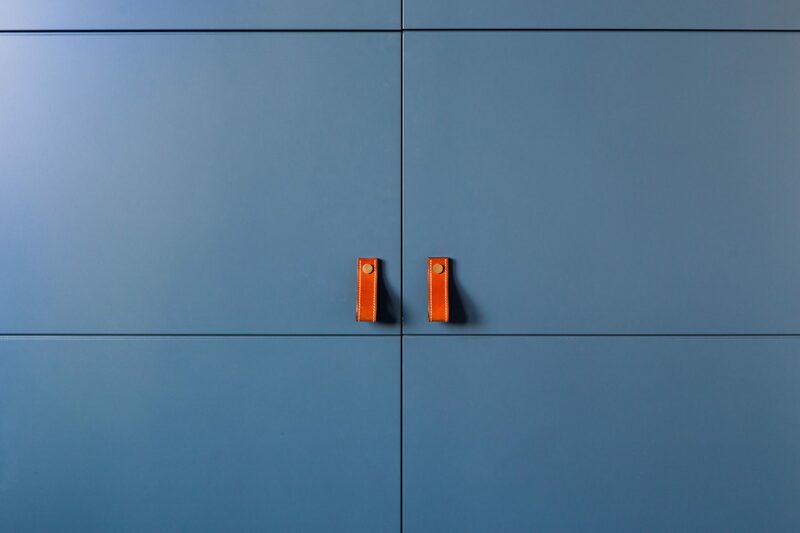 The design was beautifully minimalist but effective and featured large painted slab doors finished in Stiffkey Blue. 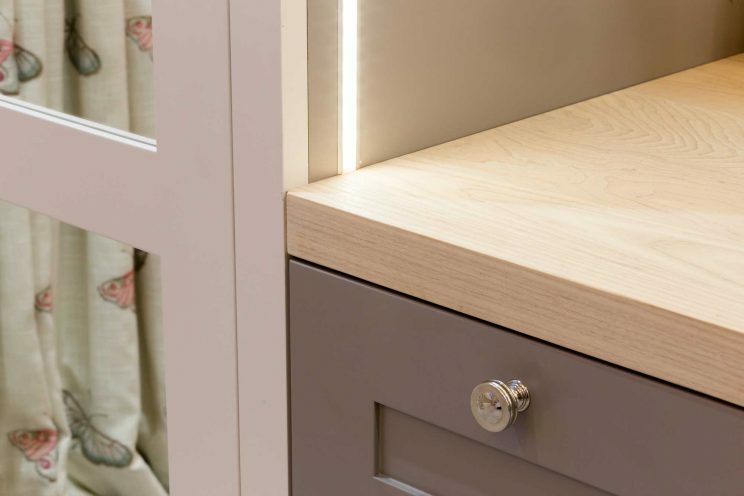 We crafted the cabinets to fit the space perfectly, including around the existing light fittings. When you open the doors you’re in for a surprise, as the internal deep touch-to-open drawers were painted in a bright orange—enough to brighten up anyone’s day. 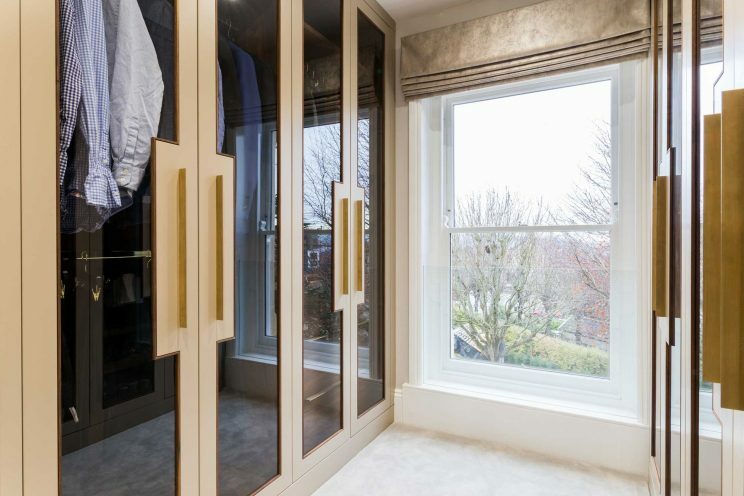 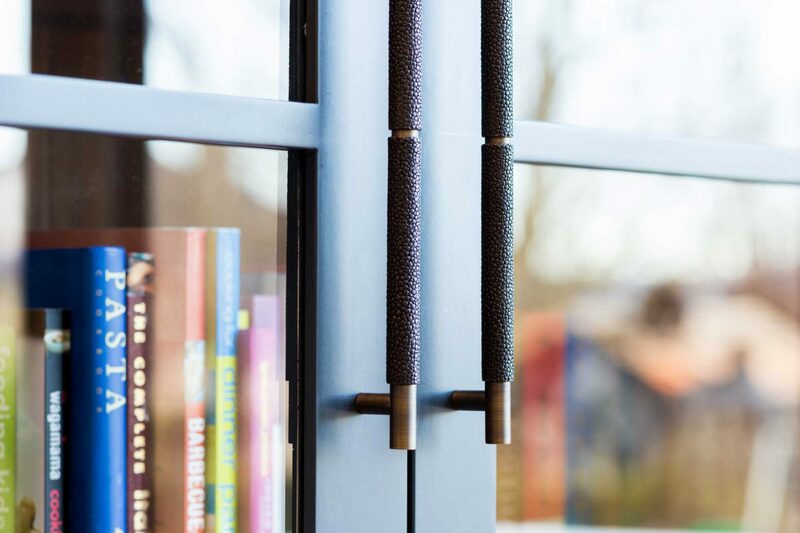 Alongside large fitted mirrors in the internal doors, the client also added small leather handles which added character to the simplistic design. 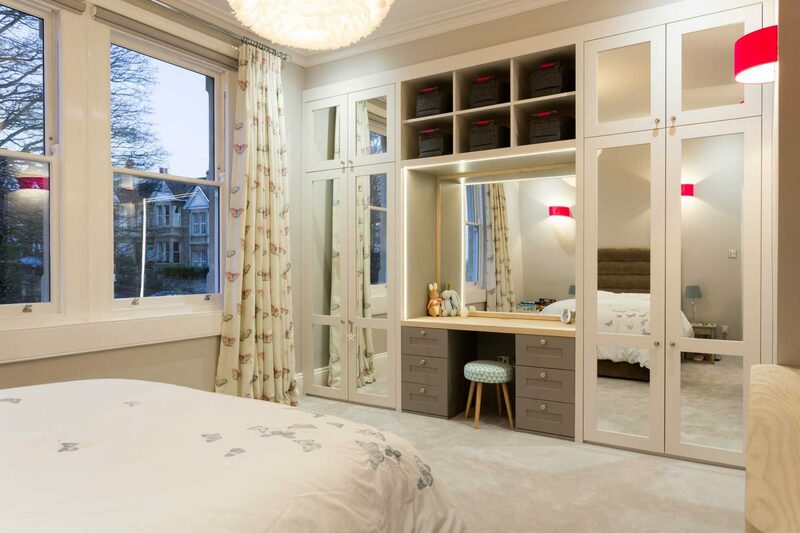 Likewise, we also worked closely with our client to design the perfect storage solution for her little girl’s room. We crafted and fitted a series of cabinets, painted in a strong white tone, with glazed doors, a shelving unit with space for pull out boxes and also a dressing table space with solid ash worktop and Worsted painted drawers. 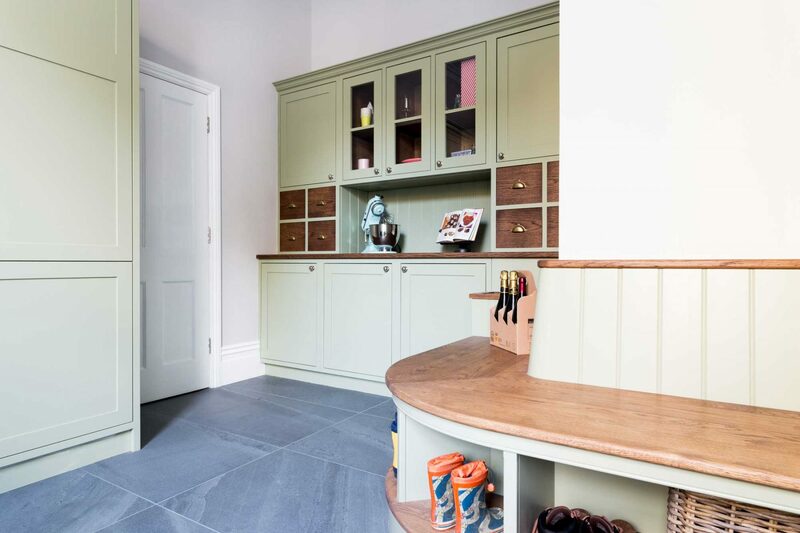 Again we used round Armac Martin handles to complete the elegant design. 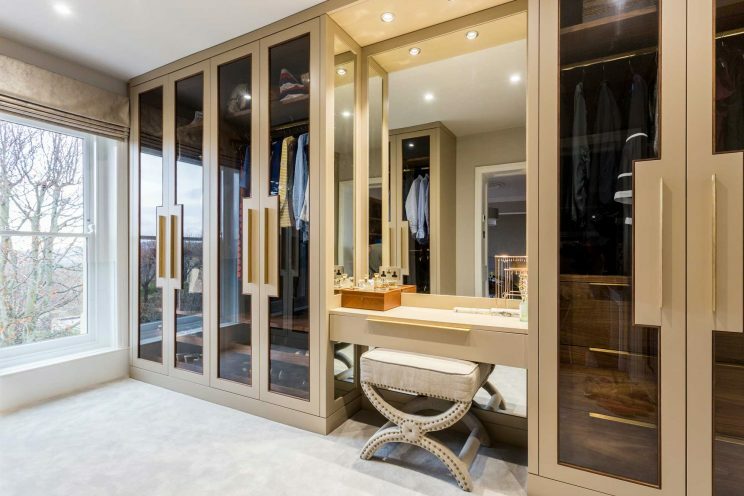 Our client was really happy with the results and it was a fantastic project to be involved in. Thanks also to our photographer Billy Bolton. 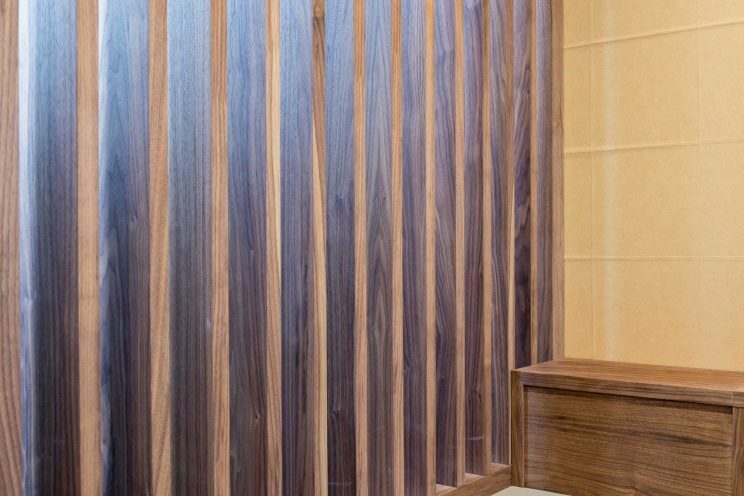 You can find out more about the man behind the lens in our interview with him here.